and in the next pic below you see the power of yors cartidge/bullet combination. 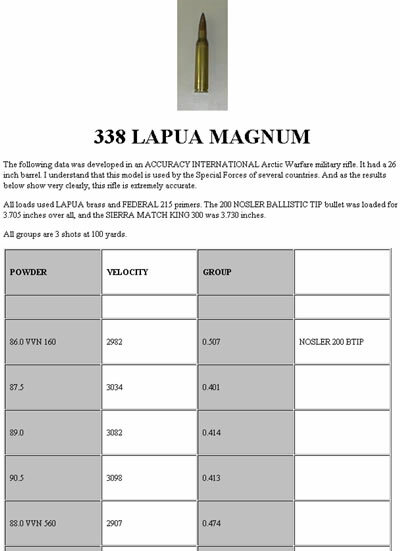 Theload tables should give you at least information about the case, primer, powder and bullet used and the expected velocity and pressure. In the examples above you get a bit more information about that specific load but some loadtables gives you the minimum. 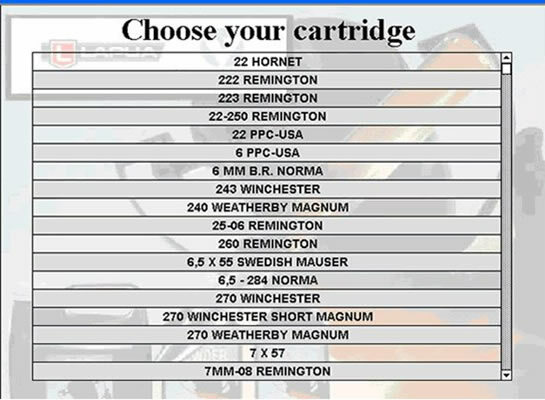 The example above also digital from the http://www.accuratereloading.com. 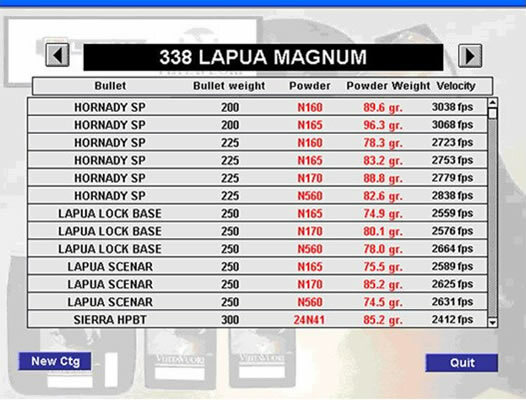 The example above is a loadtable from Vihtavuori-lapua The latest loadtables can be downloaded in pdf from there. 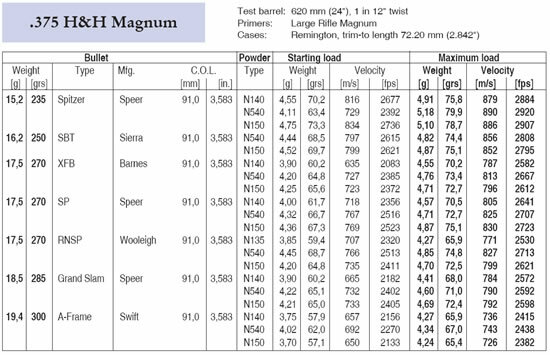 Maximum and minimum loads, what are they? Minimum load are the one to start with and the maximum NEVER to go over! 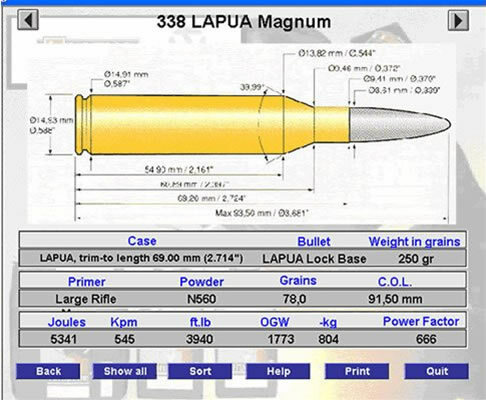 Maybe you use the exact recipe that yours loadable shows. But think again! Do you have the same gun? Or case? Or lot of powder? No you don’t! 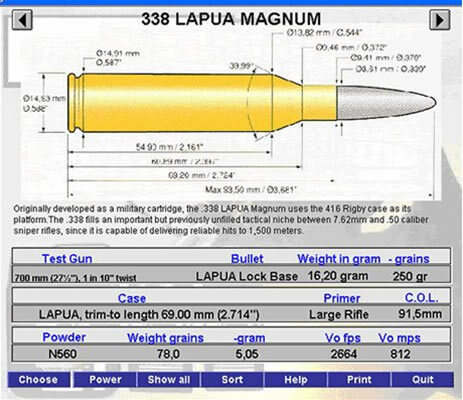 Remember that yours gun, reloading tools and components aren’t the same as the bullet or powder factory used in the actual load development. Never exceed the maximum load and approach it carefully. Now, let’s talk about yours loadtable. The one you write down the recipe for your cartridge. Always do that so you can look at that cartridge a few months from now and know exactly what’s in it. In yours loadtables you can also write down everything about how that combination worked on the target etc etc. Yours load table can be on paper or if you want it in digital form. You want one in digital form for your computer? Take a look at the NSTL in here.. .